VeMMa at Sunkiss’d.What do Ponce de Leon, Donald Duck and Jack Sparrow (Captain Jack Sparrow, of Pirates of the Caribbean fame) all have in common? They’ve all gone searching for the infamous “Fountain of Youth” in hopes of extending their life expectancy and youthful countenance. Too bad they never thought to come to San Clemente and take a walk up Avenida Del Mar. Surprisingly, the main thoroughfare of our little Spanish Village by the Sea offers many opportunities to partake in a healthy lifestyle and to possibly make our extended years a little more enjoyable. The first stop on any Fountain of Youth tour on Del Mar would have to be Sunkiss’d Tanning Salon. 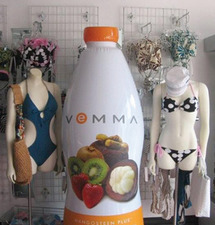 For years Sunkiss’d has been know as a great place to get a tan or purchase a bikini but now you can also find an exciting new product called VeMMa. VeMMa is a nutrition program made from Mangosteen, also known as the “Queen of All Fruits”, which has been used for centuries by Asian health practitioners for its nutritional benefits and its delicious flavor. Combining the antioxidant-rich power of mangosteen with vitamins, plant-sourced minerals, organic glyconutrient-rich aloe vera and decaffeinated organic green tea, the makers of VeMMa have created an ultimate nutritional foundation. And no one is a greater believer in the product then Sunkiss’d owner Brenda Carter. As an actual user of the VeMMa product she is definitely its greatest supporter. After getting your dose of VeMMa from Brenda, cross the street to the Del Mar Vitamin Center and find owner Barbara Vlach. Be careful what you ask her because her knowledge about health and nutrition can literally keep you talking for hours. Somewhat hidden down the promenade in a small space, Barbara has created a charming art festooned “wellness center”. So much more than just a place to buy vitamins, Barbara concentrates on serving the whole person and all of their health and nutrition needs. And her newest addition, the TurboSonic, is literally the most advanced technology in health and fitness. Created in the Soviet Union to condition Soviet cosmonauts, the TurboSonic uses patented vibration technology to stimulate every part of your body, from cells to blood vessels, to organs and muscles. These vibrations can increase the body’s natural healing responses, increase cellular oxygen uptake and enhance cellular nutrient uptake and waste removal. Together these processes slow aging by improving blood and lymph circulation, digestion and muscular flexibility. Barbara offers every customer a free trial on the TurboSonic and swears that once you’ve tried it you’ll be addicted. You can use the machine as frequently as you like, with Barbara offering package deals for repeat customers. On the quest for the “Fountain of Youth” a stop by the vitamin Center and a ride on the TurboSonic is a must do. 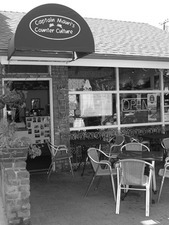 With your cells oxygenized and your antioxidants refreshed take a stroll up Del Mar and stop in at Captain Mauri’s Counter Culture to have an order of Acai, otherwise known as Superfood Number One. Studies have shown that this little berry is one of the most nutritious and powerful foods in the world! Açaí (ah-sigh-ee) is the high-energy berry of a special Amazon palm tree. Harvested in the rainforests of Brazil, açaí tastes like a blend of berries and chocolate. The Acai berry is filled with antioxidants, amino acids and essential fatty acids, and when the owner of Captain Mauri’s, Mauricio Guitierrez, blends those delicious berries into a juice based smoothie complete with apples, bananas, organic granola and cashews, your energy level is guaranteed to go through the roof. As a working chef for over twenty-five years, Mauricio was excited to take over ownership of his own business nearly three years ago. While he has enjoyed adding some of his own recipes to the menu ( don’t get me started on his huevos rancheros sauce), Mauricio has worked hard to retain the original mission of the restaurant, to provide a healthy dining option on Avenida Del Mar. “All of our vegetables are organic, and we serve only the freshest ingredients,” boasted Mauricio on my last visit. “We have customers who stop here every morning to have a shot of our wheat grass to start their morning right, then they’re back later in the afternoon for the acai, served either in a bowl or in the smoothie.” And after sampling my own bowl of the healthy concoction I can see why. After just one taste I was hooked, and now plan to make the acai concoction a frequent part of my diet.